Ninjutsu, or art of the ninja is a japanese martial art based on techniques and tactics. It is complemented with the learning of many skills useful for espionage. 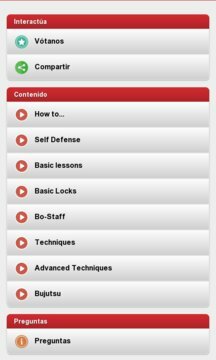 With this app you will learn this martial art millennial. You will find high quality videos of the different techniques of the ninjutsu: Taijutsu, bojutsu or Kenjutsu among others. This application is suitable for all levels, even for those who want to enter in this martial art and become future ninjas. This martial art as many others (Karate, kung fu, ect) combines body and spirit to achieve a great balance between body and mind. It is ideal for improving your physical well-being and mental. Download this app and become a real Ninja for free.